A spark plug is an electrical device that fits into the cylinder head of an internal combustion engine and ignites the compressed air/fuel mixture by means of an electric spark. Spark plugs provide a small gap in a circuit that high-voltage electricity will arc across, like a small bolt of lightning. Air typically breaks down, forming an arc, at about 30,000 volts per centimeter. Spark plug operational voltages typically vary from 40,000 to 100,000 volts. Another important task of the spark plug is transferring heat from the combustion chamber. Sparks plugs do not create heat, but they operate as a heat exchanger by pulling unwanted thermal energy away from the combustion chamber and dissipating it to the engine cooling system. 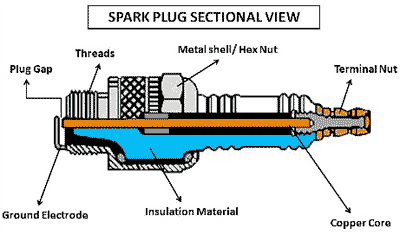 Spark Plugs contain an insulated center electrode on one side of the gap. On the other side is a metal finger that connects to the engine block. Spark plugs use a ceramic insert to isolate the center electrode from the engine block everywhere except at the gap. Ceramic is a fairly poor heat conductor and gets hot during operation. This heat helps to burn off deposits from the electrode. There are two common types of spark plugs. As seen in the figure to the left, a hot plug is designed with a ceramic insert that has a larger surface area exposed to the combustion gases, reducing the heat transfer from the ceramic. This enables it to run hotter and thus burn away more deposits. 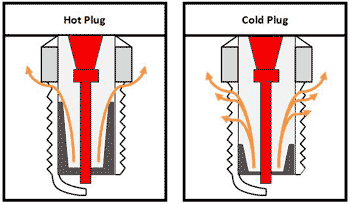 Cold plugs are designed with a smaller surface exposed to the combustion gases. As a result they dissipate heat more quickly and run cooler. Some vehicles with high performance engines naturally generate more heat and require colder plugs. It is important to stick with the right type of plug for a vehicle. If the spark plug becomes too hot, the fuel could ignite before the spark fires. The high-voltage that drives a spark plug in most automobiles is generated by an ignition coil or magneto. Current flowing in the coil is suddenly interrupted when a switch is opened. The fast rate of change of the current in the coil generates a high voltage across the coil. Small engines (e.g. lawn mowers, chain saws, etc.) may store the electric energy for the spark in a capacitor instead of a coil. Federal Mogul has introduced a spark plug replacement that generates high-frequency, high-voltage arcs instead of a single spark. The technology is similar to that of a Tesla coil. How Automobile Ignition Systems Work , Karim Nice, HowStuffWorks.com, Jan. 23, 2001. Bosch Iridium Spark Plugs, YouTube, July 11, 2011. Federal-Mogul Advanced Corona Ignition System (ACIS) ..., Green Car Congress, Sep. 14, 2011. Return to CVEL Automotive Actuators Page.